Once upon a pillow, I decided it was time to dress up the bed. I decided on shams and it gave me pause to think. What exactly is a “sham”. Further, I realized that there are shams, and there are more shames. Like Bubba Gump shrimp, you’ve got European shams, king shams, cushion shams, basic pillow shams…sham, sham, sham shammity sham! In my mind they’re all just pillows, and I had simply merged them into my brain as one lump sum. Quick history lesson. The term “pillow sham” came about in the 18th century. The word “sham” means a thing that is not what it is purported to be. In other words, a fake. That’s not to say that a pillow sham is fake thing, but there is certainly a disguising quality to the pillow sham. 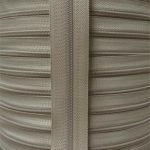 Pillowcases known as shams, mean literally pillows with a “false front”. 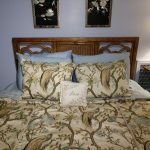 Unlike the standard pillowcase designed to cover a pillow used for sleeping or propping up on, a pillow sham was made specifically as a decorative cover with closures allowing it to be removed so the pillow beneath could be used. Unlike your bed pillows, shams are the pillows that usually go right in front of the headboard. They coordinate with the duvet or quilt. They’re not meant for sleeping on, just decoration. 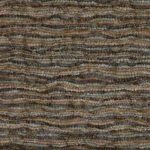 They’re different from a basic pillowcase in that they frequently (not always) have flanges around one or more edges, and are meant to add color/texture to anchor the rest of your pillow collection. 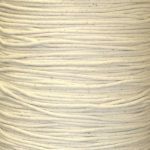 There are three sizes: standard shams (around 20″ by 26″), king shams (around 20″ by 36″), and European shams (which are square, around 26″ by 26″ or larger). And like a proper table setting, there’s an order to arranging shams on your bed. As for the pillows you actually sleep on, those would generally be placed in front of the shams and before the cushions. Got it? Good. 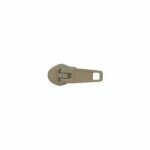 For each sham, you’ll need approximately one yard of fabric, three yards of piping, 1.5 yards of zipper coil, and one slider head. 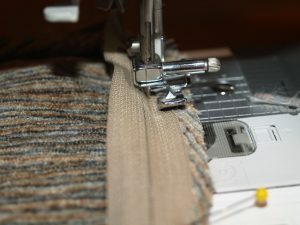 For three, use three yards of fabric, nine yards of piping, and 2 yards of zipper coil with three slider heads. The pillow forms used are 27″ square, so I cut out six 26″ squares of the Hocus Pocus Dove fabric. I know you are probably thinking, she messed up because everyone knows that you have to cut the fabric larger than the form but in this case I wanted my pillows to be full and appear overly stuffed. When finished the pillows will measure 25″ square. 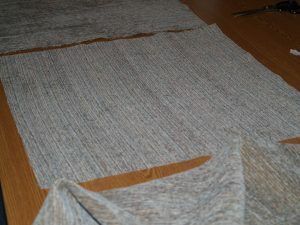 Next I cut two inch wide strips of fabric on the bias for piping cover. 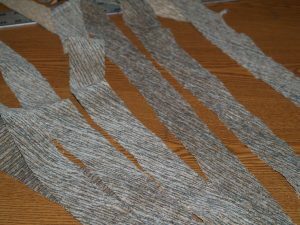 Making sure to cut enough that each form will have approximately three yards of piping cover. 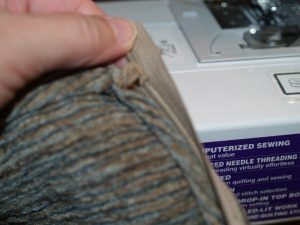 Sew the strips of piping cover together to create one long strip. 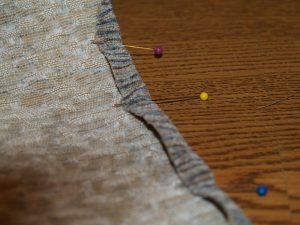 Now place the cottoning welt inside the strip and using a zipper foot start sewing. Once you have all the piping covered start adding to the front of each pillow. 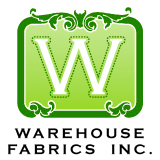 In my case, I have six 26″ squares cut out so I placed the piping on three of the 26″ squares. I love to put zippers in my pillow covers which makes it easier to send to the cleaners and get cleaned as needed. 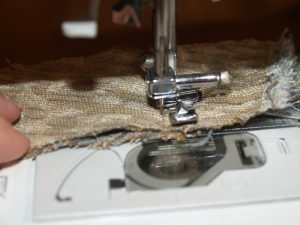 I started by placing the zipper face down as shown in the photo close as possible to the piping. Notice how close I am sewing the zipper to the piping. 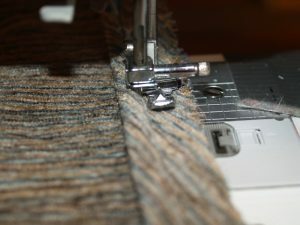 This is how it should look when you sew the first side close to the piping. 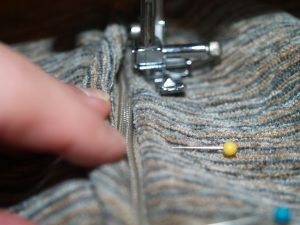 For the opposite side of the zipper, pin down one half inch seam allowance as shown. Next place it face side up as shown in the photo and stitch. The last step is to sew the front and back of the Euro together. 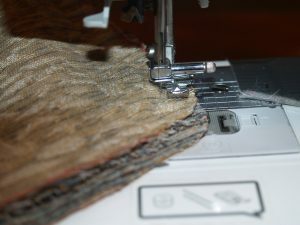 Begin by starting at one corner of the zipper and sewing around the perimeter of the Euro until you reach the other corner of the zipper opening. 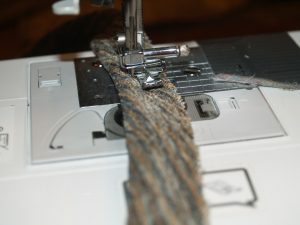 Sew close to the piping. 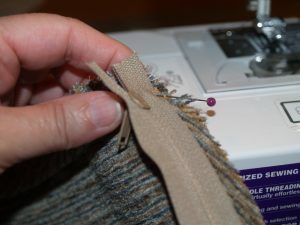 Remember to always leave the zipper opened so you will be able to turn the finished product inside out. Let’s make a Euro sham! How to make a decorative pillow with a zipper!